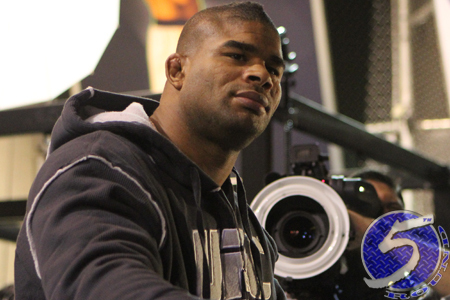 Alistair Overeem (Pictured) is eligible to reapply for licensing with the Nevada State Athletic Commission as early as December 27th. According to the former Strikeforce heavyweight champ, he’ll be adding to his trophy collection upon his return. “I’ll be fighting again in December and mark my words, I’ll be back to get the belt, sooner rather [than] later,” Overeem tweeted. Overeem was set to challenge reigning champion Junior dos Santos for his hardware at UFC 146 until “The Demolition Man” destroyed the highly-anticipated shootout by flunking a random pre-fight drug test. The 32-year-old lost his appeal against the NSAC and was levied a nine-month suspension for registering more than double the permitted limit of testosterone in his system. Despite his lengthy sabbatical, UFC president Dana White recently revealed Overeem will retain his top contender moniker when he returns to the Octagon – much to the dismay of dos Santos, who doesn’t believe a win over Brock Lesnar parlayed with a drug ban warrants a crack at the crown. Dos Santos is currently scheduled to defend his throne against Cain Velasquez at UFC 152 on September 22nd. If the victor of that shootout escapes unscathed, the timing would be just right to welcome Overeem back to the big leagues for a blockbuster New Year’s weekend extravaganza.